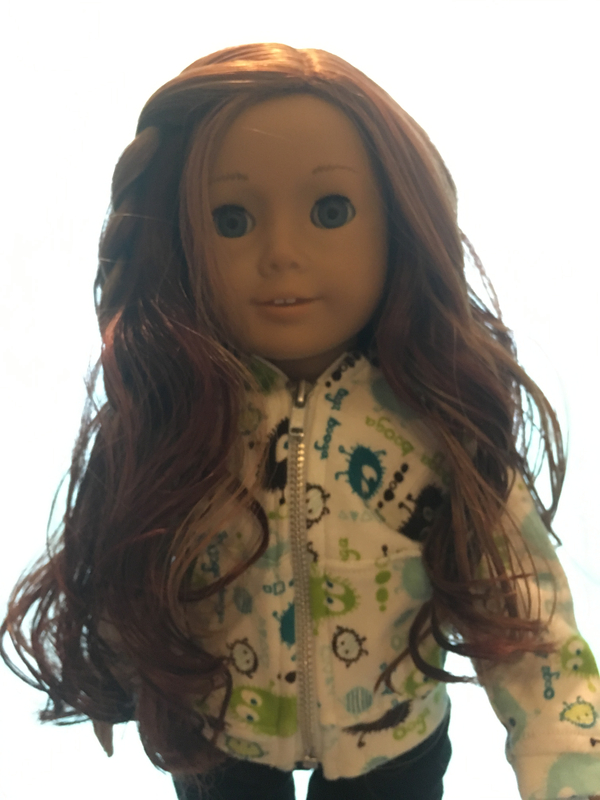 Last year I won an auction for 3 American Girl dolls that were in need of some fixing. I was able to resell one of those dolls for nearly twice what I paid for all 3 dolls. 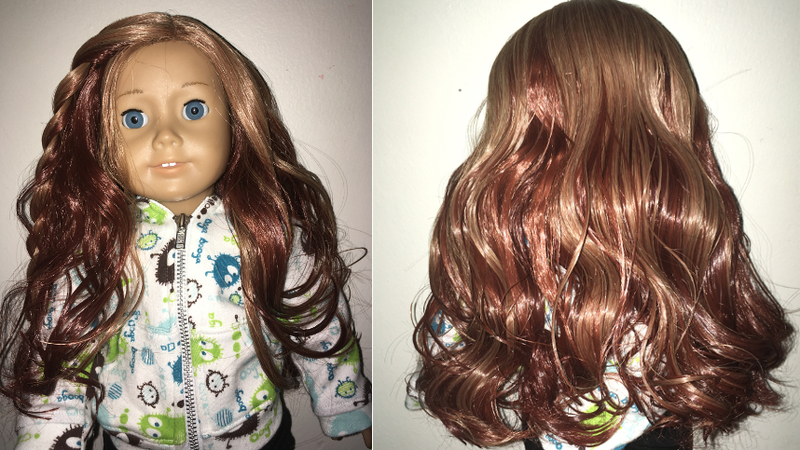 I kept the one that needed the most work for myself and gave the other, which only needed a wig, to my youngest daughter. She was delighted with it, and immediately named her Sabrina. Sabrina is an American Girl Truly Me #33 and over the last year she has had many hair styles and even 2 hair cuts, all of which I surprisingly was able to fix. Until now.. This picture doesn’t actually do the damage justice, but it’s the only one I snapped prior to peeling the wig off. You can’t see the tattered burnt looking ends and the bald patches that don’t allow for any type of piggy tails. So we decided a new wig was in order! 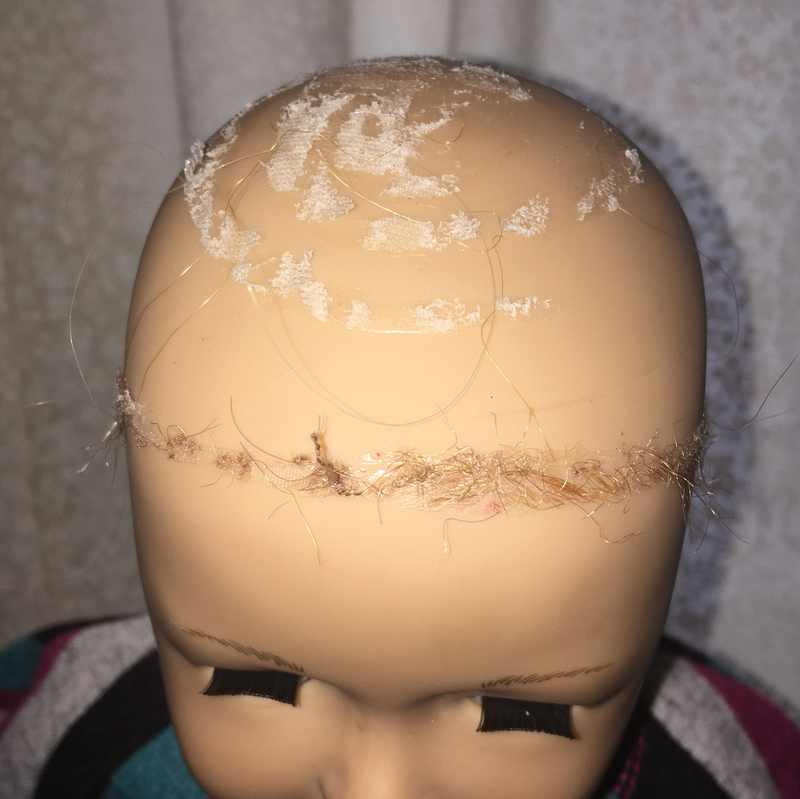 Taking off the wig proved to be super easy, I did not need any solvent at all, I just grabbed it at the back and pulled slowly and it peeled right off. I just went over the glued areas with a light sandpaper and all the fuzz came off. 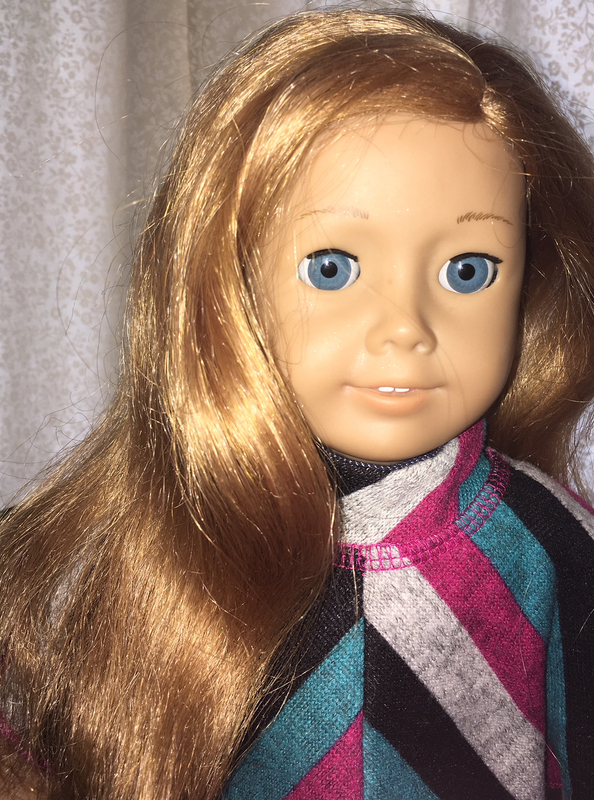 I read a lot about types of glue to use and decided on Aleens’s Fabric Fusion, which I had used on some fashion doll re-roots with excellent results. Initially I swirled some in the center, set it on the head the way I wanted it and allowed it to dry overnight. The wig is so well made and heavy that I wanted to glue it in sections so it would sit right. I came back to it the next day and glued down the front of the hairline and left it overnight again. When I came back again to glue down the rest, my son suggested we try Gorilla Glue Hot Glue Sticks. Even though I read that hot glue was not the best for this application, I figured if it didn’t work we could easily remove it. So, try we did and it worked out great! 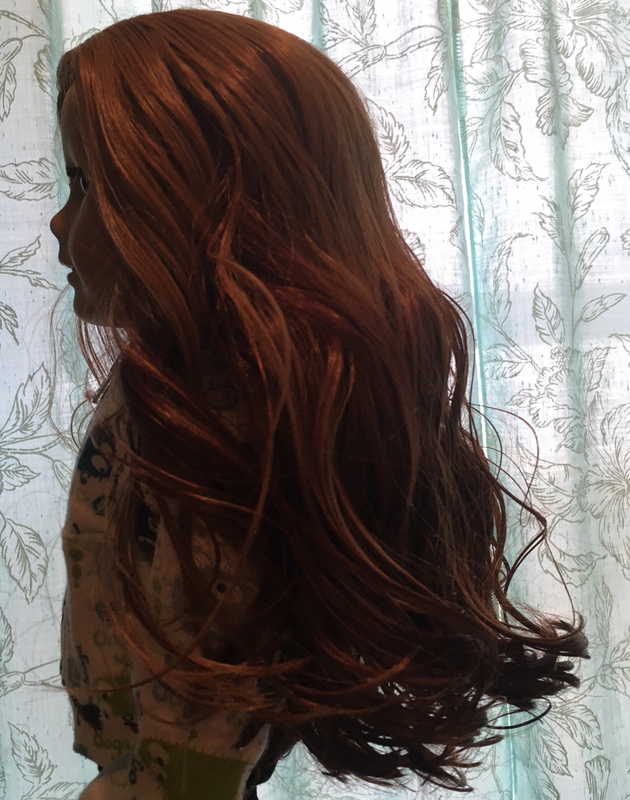 I’m happy to report that it’s been over a week and the wig has been washed and brushed vigorously, cut and played with – and it’s still sealed tight to her head! This heat safe wig is from LOLLYLUESTEPHENS on Etsy and I really can’t say enough good things about the quality of this awesome handmade wig. It’s a beautiful transformation, and the wig is so totally awesome that it was actually hard for my daughter to play with. So much beautiful hair was hard to get in and out of the jeep she’s always driving around .. haha and needed to be toned down a bit. Would have been fine if it were sitting on a shelf, but not many dolls have a shelf life in this house! So I untied her strings, popped off her head and took it to the sink for washing. I used very hot water to soften the curls a bit and brushed then combed it out and gave it a nice chop! So much easier to play with! It’s still somewhat wet here in these pictures, hence the shine. It really is a beautiful wig and even though I brushed them out, the curls spring right back up with a bit of water and a twist. 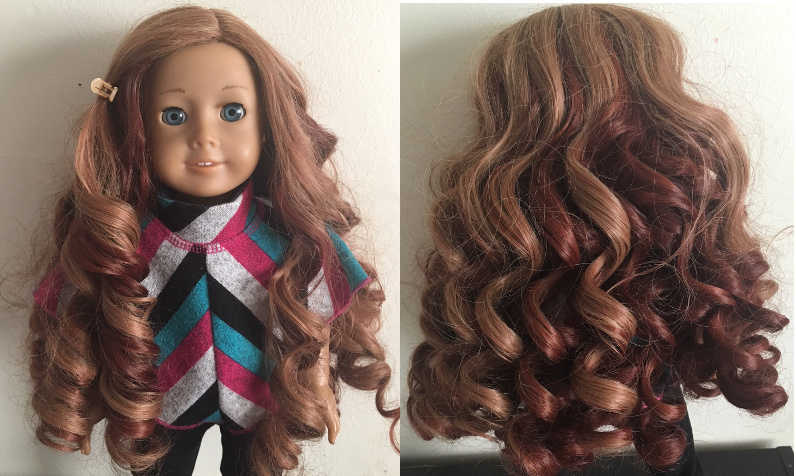 I will likely be a repeat customer of LOLLYLUESTEPHENS the next time I’m looking for a doll wig. Some hipster shots for your enjoyment..